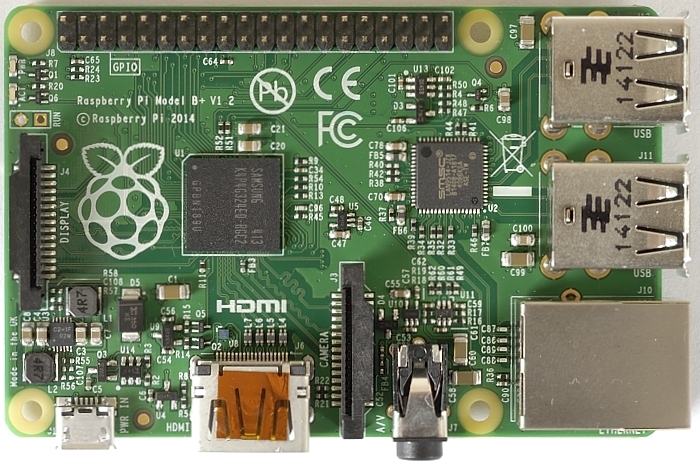 The summer also saw a new iteration (or “evolution” as the foundation calls it) of the Raspberry Pi. The Raspberry Pi Model B+ is an incremental improvement to the older Model B (a Model A+ version is due later in the year). The Register provide an excellent review explaining the new changes. Replacement of the 3V3 linear power supply with a switch-mode supply (around 30% power saving) – users of my 5V Switch-mode PSU will be well aware of the advantages! The 26 pin P1 header has been extended to 40 pins (the first 26 pins are identical to the original version but add-ons which fit directly on to the GPIO header may have problems fitting) – ALL of my add-ons will work exactly the same with the Model B+, simply wire them to the top 26 pins. Looking closely at the GPIO pin functions there is also an additional hardware PWM (which is extremely useful for directly driving servos). By having two hardware PWMs it is dead easy to add a servo controlled tilt AND pan fixture for the Pi-Camera! The composite video connector has now been combined into the headphone audio socket, it will function as a standard audio socket but with a suitable 3.5mm audio-video cable you can continue to use the composite video out as before. External connectors moved to two sides – which means you can mount it inside something a lot easier (fit it into a corner and all the ports will be on an edge). Although it does mean you will need a new type of case (which is fine since you probably already have a RPi to fill your old case). The full size plastic SD-Card slot has been replaced with a metal micro SD-Card slot. Since the SD-Card slot has been a particular weakness of the original Raspberry Pi this is great news. If your collect of SD-Cards are full-size ones you will have to get hold of some new micro SD-Cards – thankfully the price of an 8Gb micro SD-Card has dropped since the Raspberry Pi was first released so this shouldn’t be a big issue. I’ll be updating the guides and lessons to ensure that Model B+ users will be 100% clear how to connect the add-ons. UPDATE: I’ve now updated the user manuals and guides for the RGB-LED kit and the DPad Kit so “Plus Model” users can easily connect and use them. They are fully compatible with ALL variants of the Raspberry Pi. One particularly interesting feature is HAT (Hardware Attached on Top) which will allow Model+ add-ons to identify themselves to the Raspberry Pi allowing automatic configuration of any drivers or programs when different hardware is connected. HAT is basically a I2C interface (via Pins 27/28) which on a HAT board will connect to a I2C EEPROM (which will contain vendor info, GPIO map and valid device tree information). Note that HAT is not compulsory and would make little sense on smaller less complicated boards, however it should take the pain out of more complex add-ons such as screens and digital sound-cards for example. Potentially you could create an entire system which through HAT will be configured to function as soon as it is connected. Revealed only yesterday, Gert-Van-Loo (a truly excellent guy without which the Raspberry Pi may have not made it without his hardware skills), a new add-on for the new Model + Raspberry Pi which provides VGA output. Through some clever electronics and cunning use of the additional GPIO added on the Model B+ (so this VGA add-on will NOT work for non “plus” models), Gert has been able to provide native VGA output (i.e. full GPU output, no CPU loading, 1080p/60 and dual screen with HDMI). The best part is his has said it will be open-sourced and the components required are incredibly basic so it should be nice and cheap too! A good reason to keep hold of those VGA only monitors and LCD screens, this should help out a large number of schools. The not so good news though is it uses all but 4 of the GPIO pins…so we shall have to see what hardware we can support while using the VGA output. You can be sure that we will find a way to still use hardware with it, one way or another! You’re more than welcome to use RasPi.TV photos Tim 🙂 A credit, as you’ve done, is the right way to go about it. It’s surprising how many people don’t bother with that. Many thanks Alex, I appreciate the effort it takes to create such high quality pictures, great work. Pi-Stop – Updates, new materials and a new product!